"Ryan's 59:43 half marathon, his scintillating debut in London last year and his destruction of the US Olympic Trials field (more here), show that he was born to run the marathon." 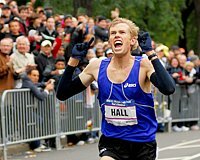 -LetsRun.com in an editorial supporting Ryan Hall for running the Flora London Marathon. 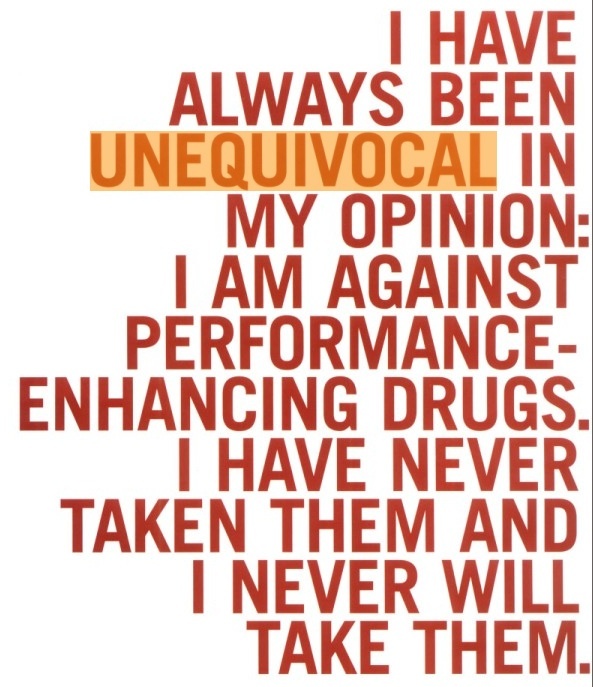 Good Read: Unpaid Law Student Took on USADA on Behalf of LaTasha Jenkins and Won But he wasn't too confident after the Floyd Landis ruling, "From reading through this previous opinion, it didn't seem like there was any glimmer of hope." In the end the result is, "that it shows the crack in the facade that 'the labs are always right.'" LetsRun.com! LetsRun.com: The Week That Was: Dec 31 - Jan 6 We recap what went on in the track and field world the last week. Catch up on the track and field world if you were too busy celebrating the New Year. Unrest in Kenya, a new 18 year old Chinese sensation, and Robert Cheruiyot doing it again, are among the highlights. 18 Year Old Zhang Yingying Runs 2:22:38 Junior World Record at Xiamen International Marathon Impressive. Plus she made the Chinese Olympic team. Previous Kenya: *Kenyan Athletes Coping With Political Unrest The situation is tense but agents report most athletes are doing ok but not training much. *Video on Violence in Kenya A day old but educational if you haven't seen any pictures. TV Station Issues Apology to Mike Conley over Erroneous Recruiting Claim By the time we had linked to the article apparently the station had retracted the report. Our apologies for not realizing that. Lornah Kiplagat's high altitude training center was forced to feed a mob and World Marathon Champ Luke Kibet suffered a head injury after being hit by a stone (the main article above mentions a machete attack that apparently is a bit of an exaggeration). Hard to believe the serene place portrayed by Wejo here and here is now the place where human beings are burning other human beings trapped in a church (the church that was burned was just 5 miles outside of Eldoret, the main training city in Kenya, and where Kip Keino's Training Center is). Iten is the small town where St. Patrick's High School, Kimbia Athletics, and Renato Canova train. Horrible:Kenyan Violence Escalates Kenya has historically been one of the more stable African nations as its 40-odd tribes have generaly gotten along fairly well. But after a possibly rigged election, the tribes are going after each other. The NY Times is reporting that the violence is at its worst in the Rift Valley (where the runners mostly train). The Rift Valley is where the most disturbing violent incident occured as a mob of mostly Kalenjin (almost all of the famous runners are Kalenjin) barricaded and then torched a church with approximately 200 Kikuyu in it, resulting in 50 people being burned alive, just outside of the training mecca of Eldoret. *1988 Olympian Lucas Sang Is One of 316 Known To Have Been Killed So Far He ran on the 4 x 400 in Seoul but also ran the 800 and was a well known European rabbit. His death was reported by his business partner and former world champ and Boston marathon winner Moses Tanui. *Kenyan Article On Sang's Death Reveals He Was A Neighbor of Noah Ngeny Sang was well respected in Kenya and had called 2000 Boston marathon champ Elijah Lagat to congratulate him on winning a parliamentary seat on Sunday - one day before he was murdered.. Earlier: Savage Tribal Killings As Kenya Erupts in Violence Following Elections Kibaki says he was reelected but international authorities have not giving their blessing to the results. Meanwhile, things seem to be getting worse every day in Kenya in terms of violence. Election chief now says, "I do not know whether (Mwai) Kibaki won the election"
After his debacle last year in the incredible mayhem that was World Cross Country in Mombasa, Bekele is back to prove what we all know, he's the best cross country runner in the world. Not good news. Meanwhile, opposition candidate Odinga claimed he's related to Barrack Obama (they are from the same tribe which as the violence in Kenya now shows, means a lot). *Lucas Sang to Be Buried Today The Kenyan Olympians was tragically killed in senseless violence. Interesting Read: Problem in Kenya is Not Tribal/ It's the Weakness of the Legislature This causes the presidency to be a winner take all system. Next Friday: Geb Shooting for Sub 2:04 in Dubai It's the worlds richest race (in terms of prize money) with a $250,000 first prize and a $1 million world record bonus. Elite Racing Sold to Private Equity Group There's money to be made off the masses as this deal shows. Hopefully, Falconhead will still be committed to putting on world class professional races as Elite Racing puts on all the Rock N Roll Marathons and the Carlsbad 5k. *Longer San Diego Union Tribune Article on Sale Tim Murphy to stay head of Elite Racing. Hundreds Mourn NYC Marathon Start Coordinator Vic Navarra In running circles, Navarra was known for being the start coordinator at the NYC marathon for 25 years. He also was an eternal optimist, a 9/11 hero, a retired NYC firefighter, and a great guy who could hobnob with everyone from the guy next door to Mayor Bloomberg. He died at age 55 last Monday after a 2-year battle with cancer. Spain: Men: T. Bekele Avenges Defeat To Micah Kogo Last Year And Hand Kenya's Joseph Ebuya His First Loss Of The Season The previously unbeaten Ebuya didn't go down lightly as he lost by a scant 1 second as an Ethiopian won for the 16th straight year in the 54th Cross Internacional Zornotza. Interesting Read: Lee Troop Profile: "There's no money, there's no glamour, unless you are at the top of your game and that does come when you're 25." Troop is Australia's top marathoner. Ryan Hall Mentioned Before Michael Phelps But we've seen Phelps mentioned like crazy so far in 2008. He'll be the star of the 08 Games. Hopefully the Tyson Gay - Asafa Powell showdown will garner a lot of attention. Komazawa University Wins Hakone Ekiden as 3 Teams Don't Finish For First Time Ever A bunch of teams had guys staggering on the course for various reasons. *Elva Dryer, Dan Browne Running Aramco Houston Half, Could We See First Sub 2:10 in Texas in Marathon? Marion Jones Lawyers Ask For Probation They point out that she's already lost a lot in terms of reputation, money, gold medals, etc. Arkansas News: Wallace Spearmon Parts with Lance Brauman and Tyson Gay to Be Coached by His Father His father was a international 200m sprinter himself. Front Page NY Times Article on Beijing Air Pollution It looks like there is a forest fire going on. But during the Olympics the Chinese will keep cars off the roads and shut down factories. Authoritarian rule has a few positive perhaps. Why Do Track & Field Athletes Cheat? The question sounds kind of stupid but the article is fairly interesting. Promoters, shoe companies, human greed and the nature of the sport are to blame. Mo Farah and Christine Ohuruogu Voted British Athletes of Year Paula Radcliffe somehow was only in 4th place. Recap of Japanese High School Ekiden You know nothing is going on when we're featuring a high school race in Japan. 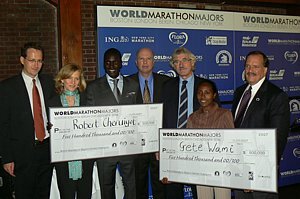 Vivian Cheruiyot Ran 14:22.59 in 2007 And Hardly Anyone Noticed A moment of silence in respect for Meseret Defar's 14:16. Truly incredible and it is the reason she was athlete of the year. At 43 Colleen De Reuck Running US Half Marathon Champs This Weekend Last year in Houston, Ryan Hall changed the running world. On the boards: Is Deena's best marathon behind her? Derek Miles Over 19 Feet at Reno Pole Vault Summit Jillian Schwartz won the women's going just over 14 feet. Meanwhile across the country Jenn Stuczynski went over 15 feet at Cornell. 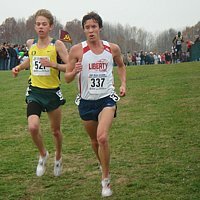 LetsRun.com Message Boarder Auctioning Off a Week in Flagstaff (Jan 26 - Feb 2nd) With Proceeds Going to Ryan Shay Fund Where else can you hit the Grand Canyon, go snow skiing, and take in the Arizona sun, all in the same week.
" People criticize me for the way that I live, but it�s my life and I alone bear the consequences." -Master's runner Brian Pope in an interesting article on whether you can love a sport too much. Message board thread on this article here. More Sad News: NY Marathon Starter, FDNY Member Vic Navarra Loses His Battle to Cancer The running world lost a lot of great people in 2007. Ryan Shay, Ted Corbitt, Mike Long, and Bobby Doyle to name a few. Joe and Sue Shay Had Difficult Christmas Coping With Ryan's Death This is a good read. The Shays spent Christmas by themselves because they did not want to depress the rest of their family. USATF Did Not Even Put 2012 Olympic Trials Out for Bid The ol' boys Nike network is back. Economics 101, competition is good, secret deals are bad. Oregon (the State) Athletic Season in Review We can pretend what we want but football and basketball are now King in Oregon. Plus news Phil Knight gave $100 million to U of O which we missed in August. Another Lengthy Article Remembering Ryan Shay Still no news on the autopsy. *What Pro Runners Will Retire in 2008?